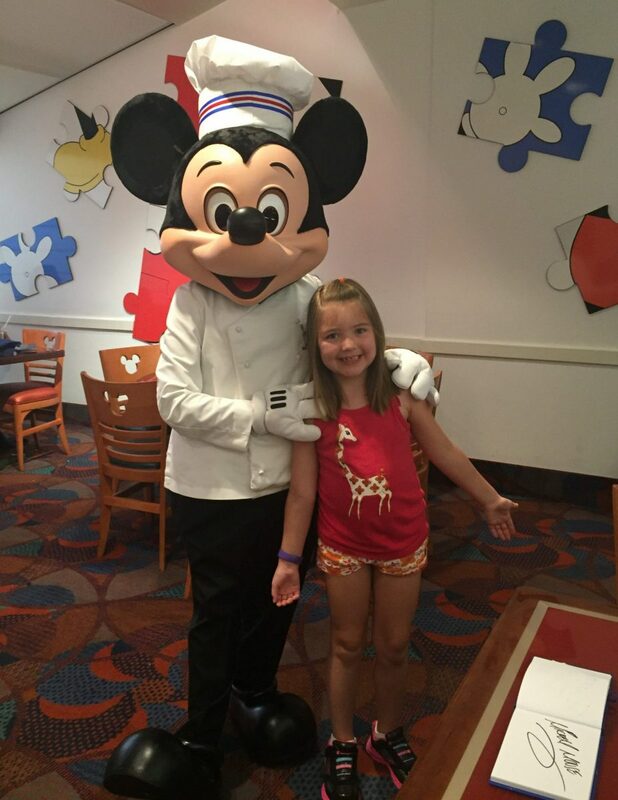 When I asked my daughter where she wanted to eat during our last Disney trip, she didn’t even hesitate when she said, “Chef Mickey’s!” We had been one other time, but she was only two years old. 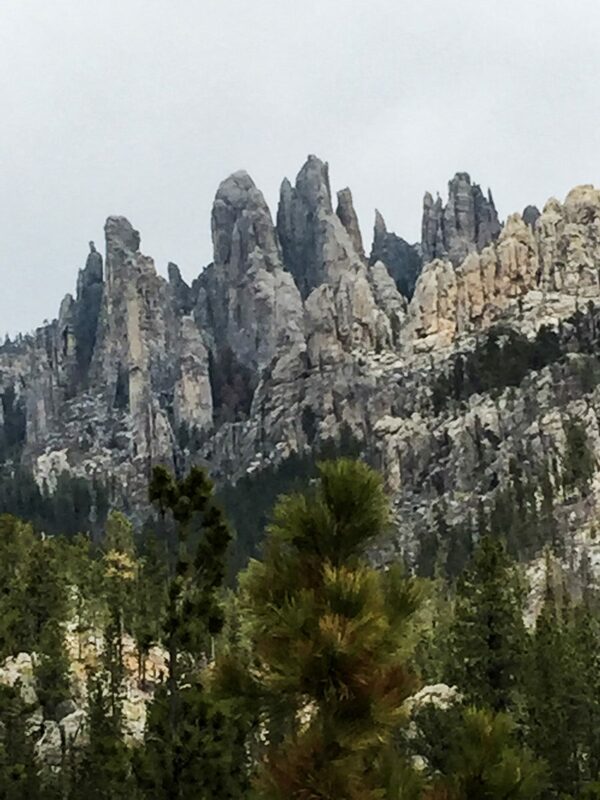 Since she had seen the pictures of that trip over and over, she knew what to expect. 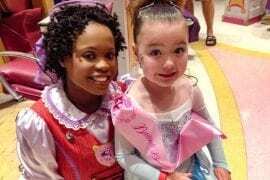 When she was two, she was really unsure about the characters, but now, she is a pro when it comes to meeting them. 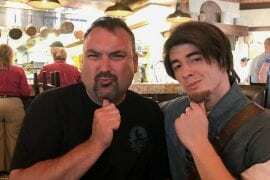 Jeff and I thought, hey, why not? Let’s go! This place is pretty popular, so I highly recommend reservations. I make my reservations as soon as the window opens at 180 days. I easily got a reservation booking that early. I also got the time I was hoping for. 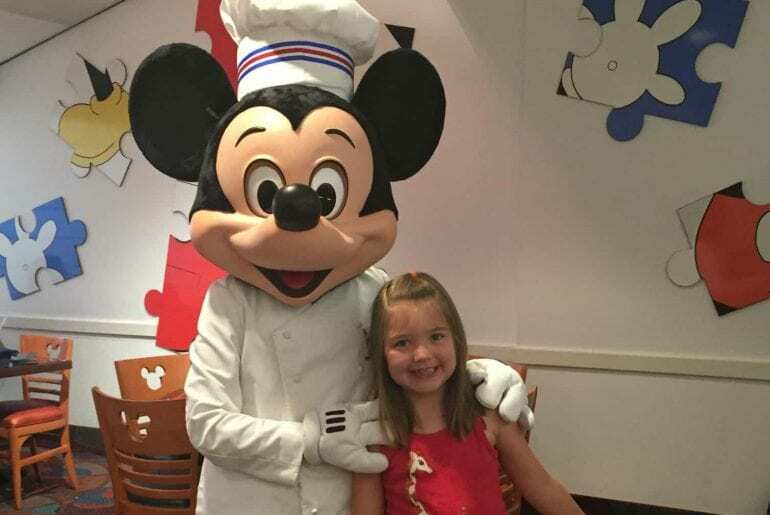 Chef Mickey’s closes in the afternoon, so you can book at or near 5:00 p.m. and be part of the first seating for dinner. That is exactly what we did. We also are afternoon nap people, so we venture back out when it is time for dinner. After dinner, we head back to a park and start touring again as the sun begins to go down. This is survival in the summer. Chef Mickey’s is at Disney’s Contemporary Resort. For this stay, we rented points at Bay Lake Tower, Disney’s Vacation Club resort that is affiliated with the Contemporary. It was nice to just walk across the sky bridge from Bay Lake Tower to the Contemporary to have dinner. When we arrived, we were handed a buzzer. Since we were in the first seating, it wasn’t long before ours went off. Before we were seated, we took a picture with a Chef Mickey sculpture. Since we didn’t buy Memory Maker, we don’t have this picture. But they do ask everyone to take one, and it is uploaded to your account through your magic band. We were seated at an upper-level table on the far right of the restaurant. It was near the start of one of the buffet lines. Our server grabbed our drink order and told us that the characters would be arriving soon. 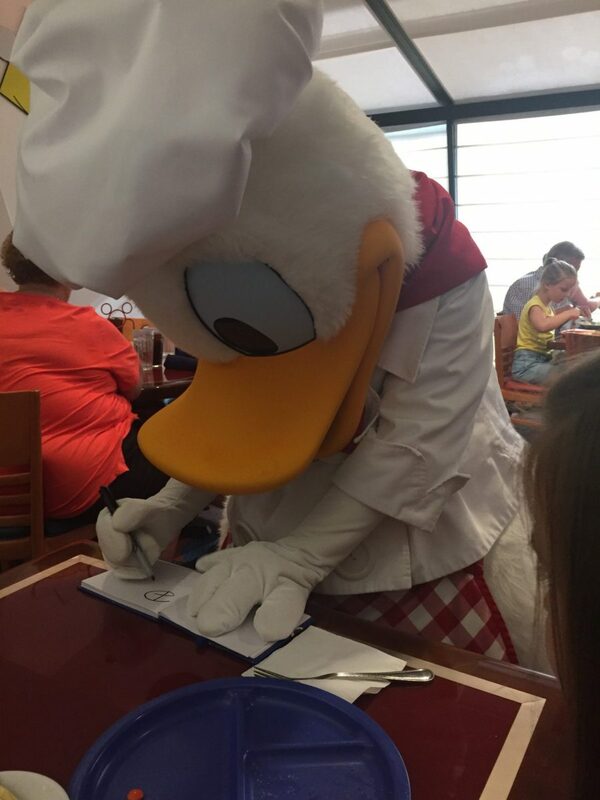 He also stated that characters would meet guests at a few rows of tables before us. That was our cue to get some food! We filled our plates and made our way back to the table. Our drinks were ready for us. It wasn’t long before we had a visitor. We had our autograph book out and we were ready. Some people complain about the food here, especially for dinner. We are pretty plain-food people. Jeff and Kristin especially do not want anything out of the ordinary. I don’t know what people are wanting for a character buffet. Maybe the food is not as good later after it’s been out longer? I think the food is pretty good. I really enjoyed the mashed potatoes, and I tried the macaroni with lobster and thought that was yummy. Jeff liked the carved beef. Kristin ate a plate full of chicken strips and was pretty happy. Kristin’s favorite of the Fab Five came by next. We did have to wait a little bit for Mickey to come around. He had his own handler, and people seem to want to take more pictures with him, so it takes him awhile. He was worth the wait! After Mickey came by, we were ready for the check. We had a night at Animal Kingdom planned. You can see that Kristin is ready for animals by checking out her outfit. We had a fun time with good food. 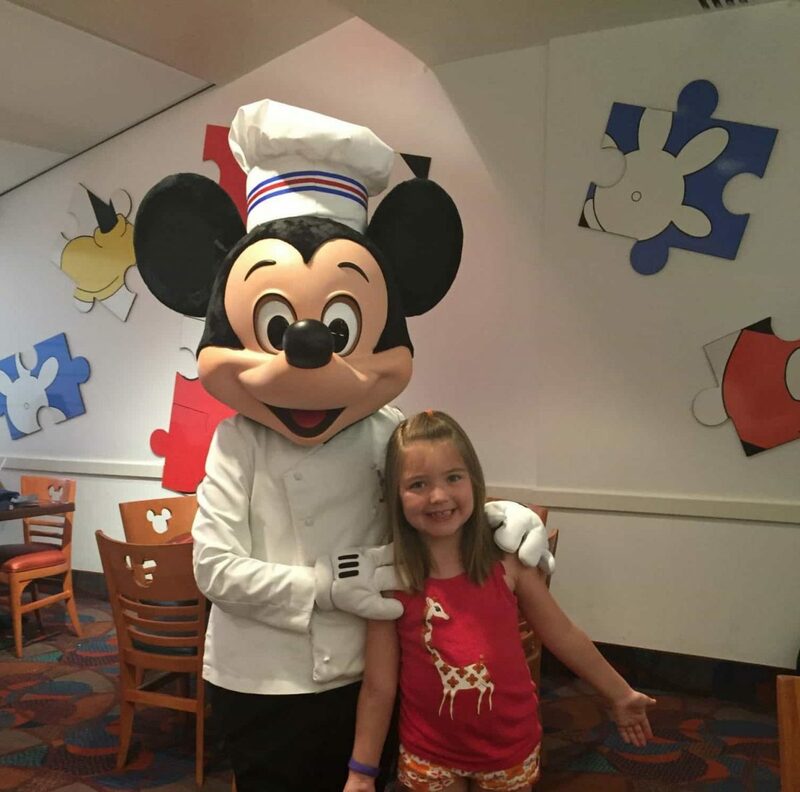 In fact, I’ve asked Kristin where she wants to eat on our next trip, and she says she wants to eat at Chef Mickey’s again. I promise she knows that there are other restaurants at Disney. I figure as long as she wants to, we’ll schedule a dinner here. Enjoy this post? Pin to Pinterest! http://www.mommatogo.com/chef-mickey/ I did a brunch and wrote about it here! I liked the food. Good variety for grown ups and kids! Good quality! We like the food. I know some people complain about it. I checked out your blog and subscribed. I also checked out your social media. 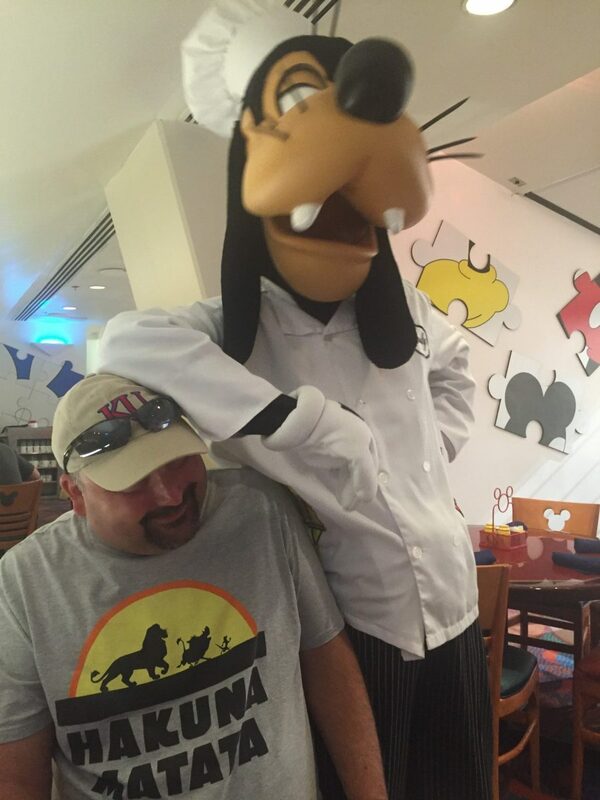 It looks like you guys have a great time at Disney! Love Disney posts! 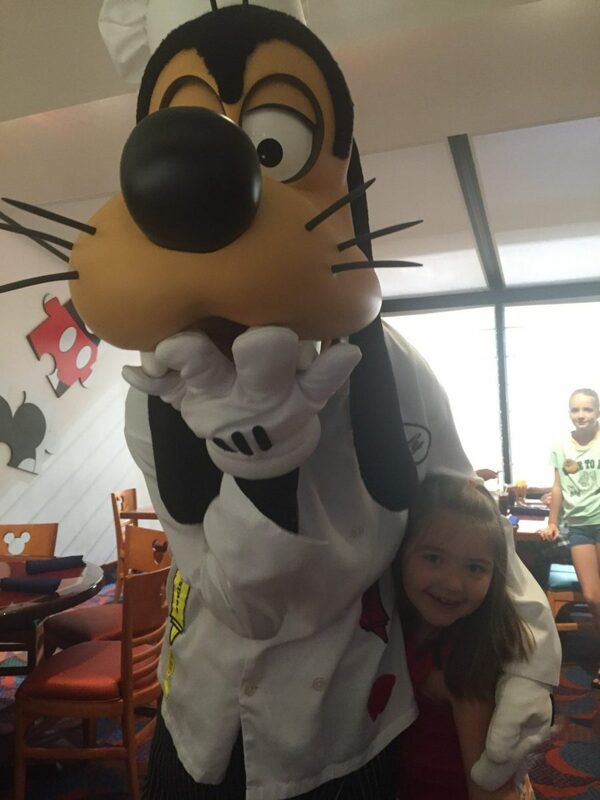 We haven’t done Chef Micky’s yet, but we have done a character breakfast at Animal Kingdom – it was so much fun!! Hope you guys had a blast! We did have fun! 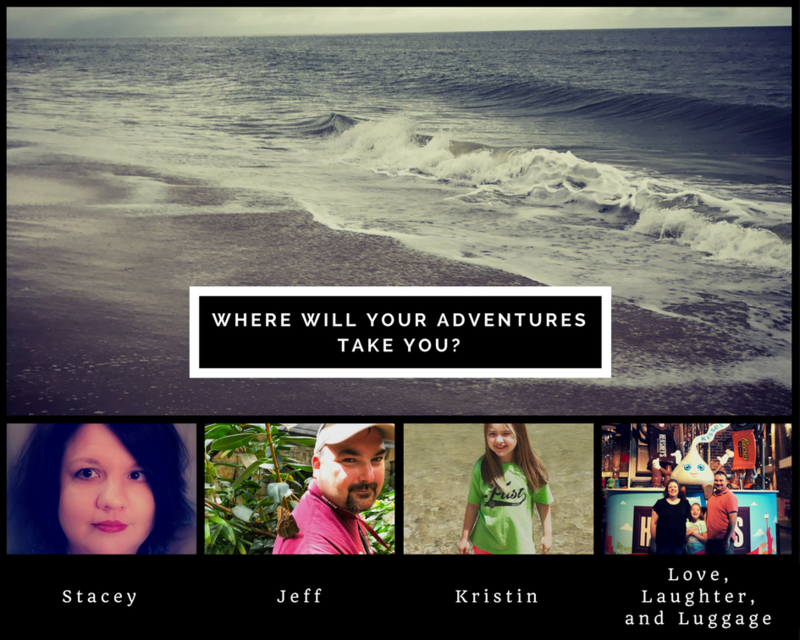 We are planning to go back in 2018, and my daughter wants to go again! I’ve never been to Disney World but this spot looks so cute! Glad you all had such a fun time! Thanks for stopping by! Disney is one of our happy places. 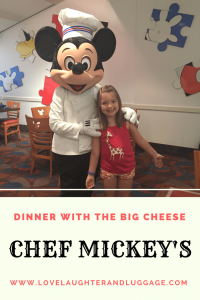 My hubby loves Chef Mickey’s too, it has such a fun atmosphere! Have you tried Ohana’s for dinner yet? 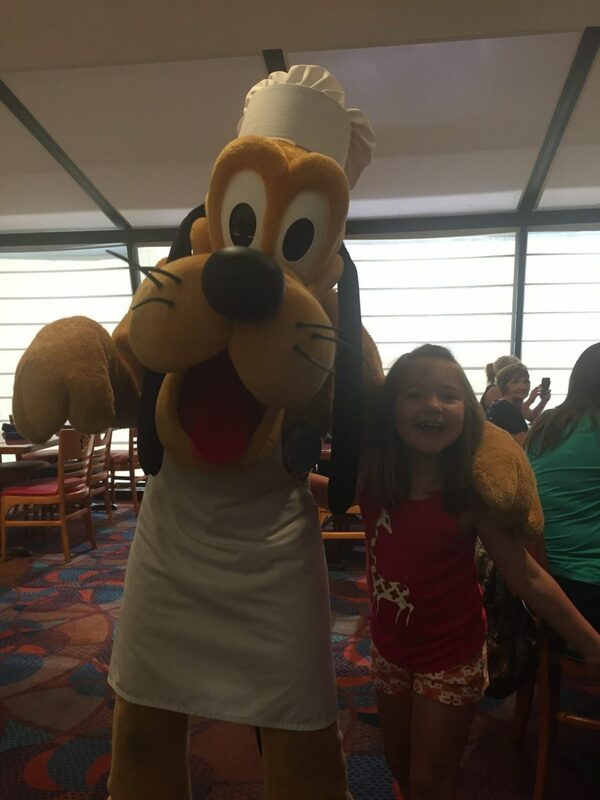 That’s our favorite Disney dinner buffet! Yes, I love Ohanna! I will write about that sometime. I’m afraid my plain-eating companions didn’t like it as much as I did, though. But I could probably convince them to go again sometime. Maybe for breakfast next time. 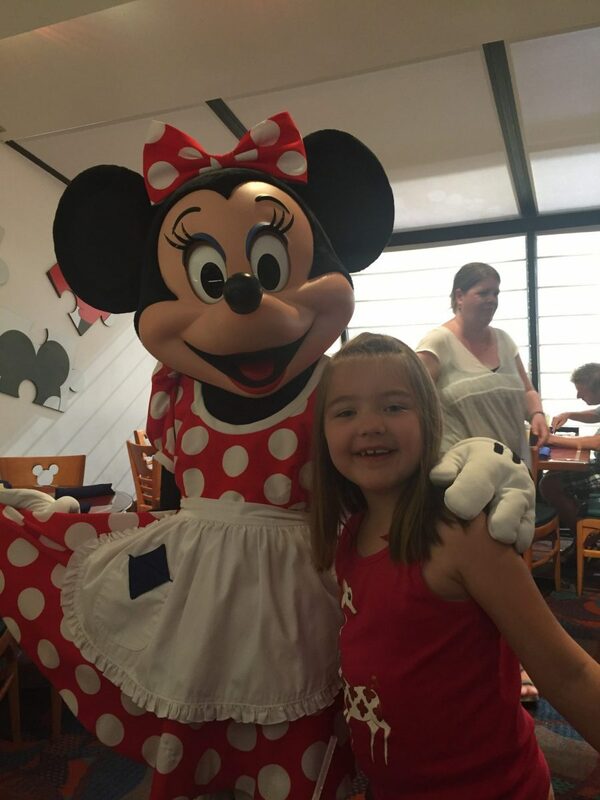 We LOVE disney and will have to try this restaurant someday- it sounds amazing! thanksf or the tips! You should! We have a great time there! 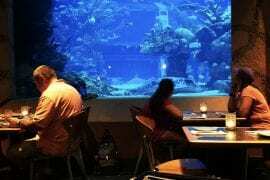 This looks like such a fun restaurant, will put it on my list for our trip. My daughter will love this! It gets mixed reviews, but we really like it. It’s perfect for picky eaters!